These 2 chaps in the photograph were a father & son team and I'd personally known the father for over 30 years. He'd contacted me to treat his 12 year old son to a day with myself up on the River Tay as a Christmas gift. None of us truly realised what lay ahead and even for myself after being involved in many hundreds of salmon captures I was even quite surprised as to how the fishing day unfolded. Following a brief Spey casting lesson where I could see that both father & son had mastered this technique and a brief chat about riverbank movement and how to react to the take we started to fish the famous Ash Tree Pool on the Tay's Lower Kinnaird beat. Within 90 minutes this young man had landed 2 heavyweight Spring salmon both of at least the 20 pound mark. When he was releasing the 2nd salmon I advised him that he'd probably be best to now just take up golf! Catching a totally wild salmon that's not only left the river of its birth but successfully fed in the ocean and eluded all predators to make it back home is a seriously special occasion. The captor of this perfect fish should always feel and often does feel an exceptional sense of achievement and rightfully so. This feeling could never ever be bettered by the biggest stocked or wild brown trout in my opinion and experience even though trout fishing in the UK has a far bigger uptake. 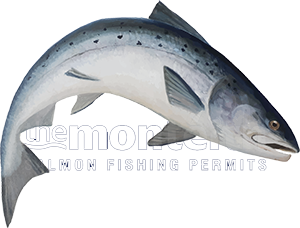 The public misconception is that salmon fishing is purely a rich man's sport but that is so not true even though sometimes certain salmon beats can be expensive there are always lower costing venues where the actual fishing permit access can be bought for £50 or under at certain times of the year. You take that kind of money and weigh up the personal value of fishing of a well managed salmon beat in perfect natural surroundings and you should easily see great value. If salmon were too easy to catch few anglers would bother with them as was the case many moons ago when all of the Scottish rivers were stuffed with fish. These days even at times when good numbers of salmon are in the rivers it still takes skill & understanding to be successful and to my mind that is a big part of the challenge & appeal of Scottish salmon fishing. If you take the time to investigate this pursuit properly and get with those who know how to present it you'll never look back.Follow this link for details on how to book a guided salmon fishing experience.